True to BENCH’s “live life with flavor” hashtag, Bench once again surprised us by presenting another one of its innovations, and redefining what it means to live life with flavor with Bench Café. Yes! 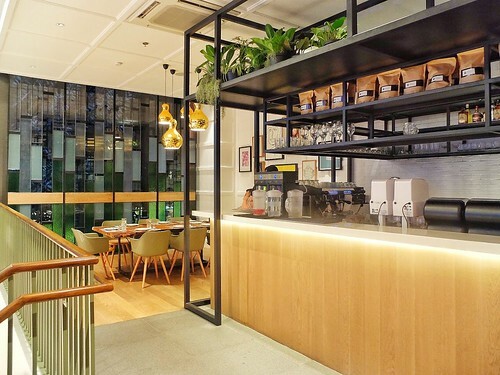 From a clothing store to a salon, and now a café! For their 30th anniversary, Bench decided to open a true Bench Flagship Store at the center of Bonifacio High Street wherein people will feel that they are not just entering a store but entering the Bench universe. Suyen Corporation took their Bench Cafe vision to life by partnering with FooDEE Global Concepts, one of Manila’s largest multi-brand food groups and celebrity chef, Carlo Miguel. 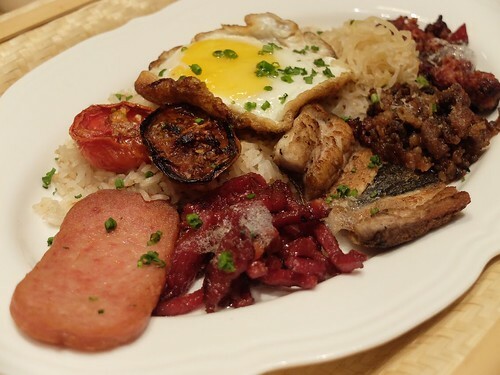 The new cafe showcases the true Pinoy traditions from all over the islands and takes your favourite Filipino dishes to a whole new level by combining traditional and modern Pinoy cooking techniques. 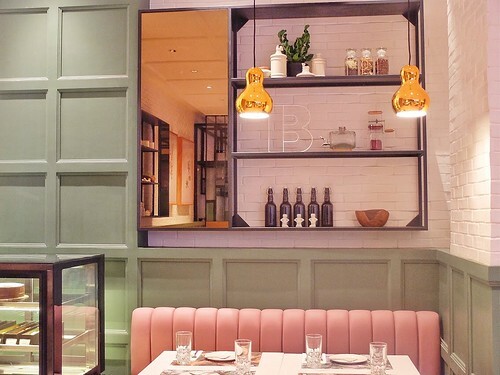 Through their food, this café makes sure that local traditions can be accessible to more Filipinos and Filipinos at heart. 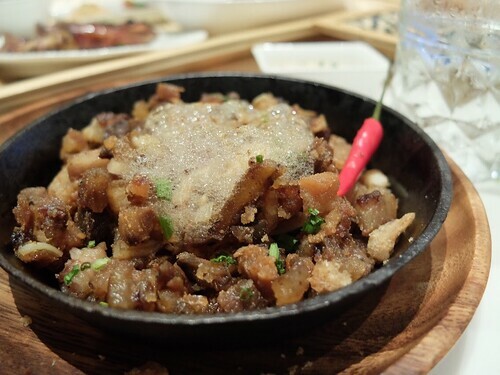 Just imagine your typical Filipino “pulutan” favourite – pork sisig. To illustrate how they combined traditional and modern cooking, the egg topping of their sisig is cooked perfectly at 62. They added utak aioli or pig brains on it which contributed to the creaminess of the dish. Also, instead of squeezing the good old calamansi as is, they topped it with calamansi foam. Regardless of the techniques, there is still one way of eating this dish – mixing it altogether and eating it while it’s hot! This one is served with lettuce so you can make your own sisig lettuce wrap. We still prefer eating it with hot steaming rice, of course! Their Tinapa (smoked fish) mousse and salad stuffed in crispy lumpia shells is a totally different story. It only took us two to three bites to devour one cone. No judging please! The idea of presenting it in a lumpia cone added a knockout factor to what is expected of it. We’ll surely not wonder if every IG story of their diners will include these drool-worthy cones. But of course, taste is king! 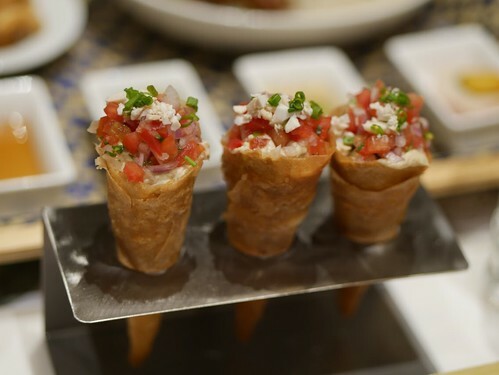 In just one bite, we felt the smooth texture of the smoky flavoured mousse and the crispy lumpia cone leaving us a fresh but altogether familiar taste in our mouth. There is, under no circumstances, a wrong time for breakfast meals! Bench Café offers an all-day selection of silogs. A must try for those who want to try a little of everything for breakfast. Have all the breakfast favorites most Pinoy love in Bonggalmusal. This includes tocino, longganisa, beef tapa, sisig and of course, fried egg. This power breakfast will definitely keep you full ‘til your next meal. 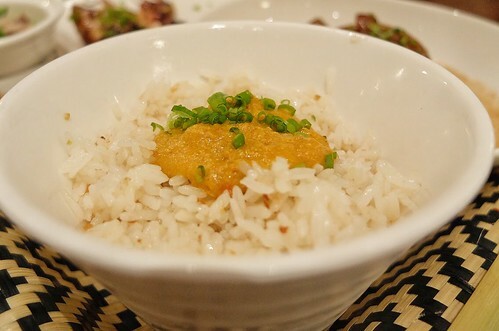 Eric Dee, COO of The FooDee Global Concepts said that The Bench Café menu features glamorized “turo turo” favorites with its rice, two viands and vegetables. You can also upgrade your meal by adding soup or special rice. They call this complete meal Bench/To (inspired by the bento meals of Japan, Bench/To). These must-try combos include viands such as dancing fish, sisig, adobo, kare-kare, pinakbet, and the special Bench Salsa. 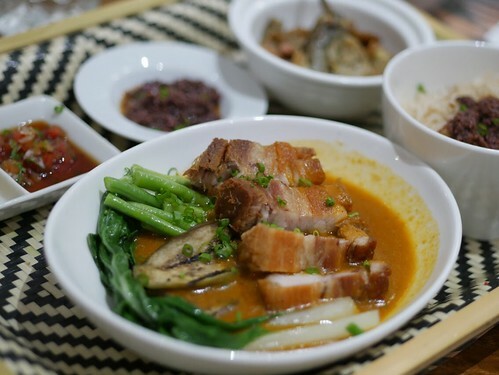 As soon as we saw Bagnet Kare Kare in the menu, we ordered it right away. The bagnet is served it with kare kare sauce underneath with the usual veggies on the side. 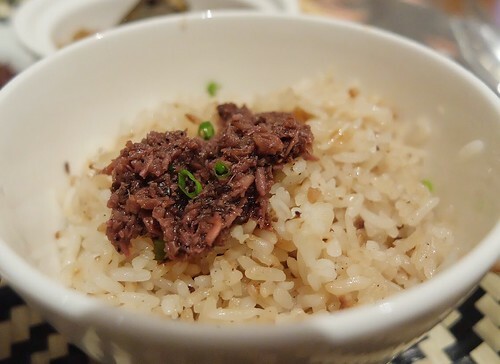 We upgraded our steamed Ifugao rice to Bagoong Rice by just adding Php20.00 to match the viand. 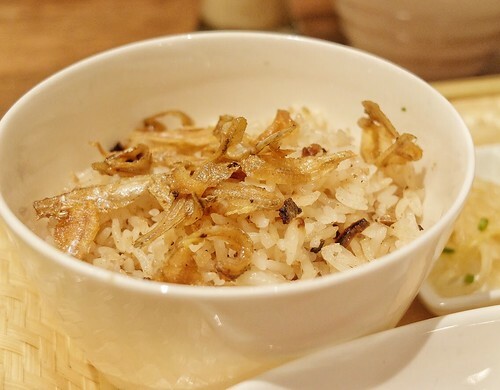 You can always try their other special rice variants if you wish — Garlic, Dilis or Talangka Rice. Our Bench/to meal came with good single serving of Tortang Talong, Bench Salsa and Atsara. The portioned serving may essentially deceive you as the whole meal is actually satisfying. 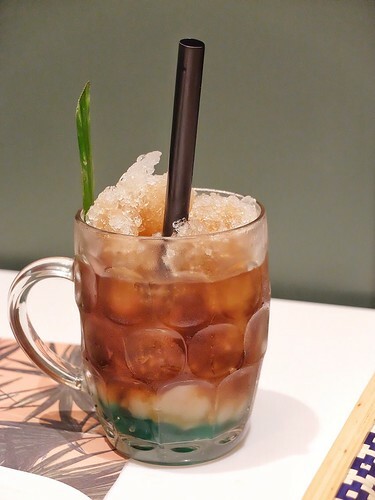 We complemented our meal with Sago’t Gulaman. In a tropical country like the Philippines, where it is mostly sunny all year round, anything cold and refreshing apart from cold water is gold. There is nothing new to this beverage. Just pure bliss. Of course, there will always be room for dessert! Local ice cream sellers/peddlers whom we fondly call “Manong Sorbetero” offer ice cream sandwiches at times, and the bread being the pandesal. 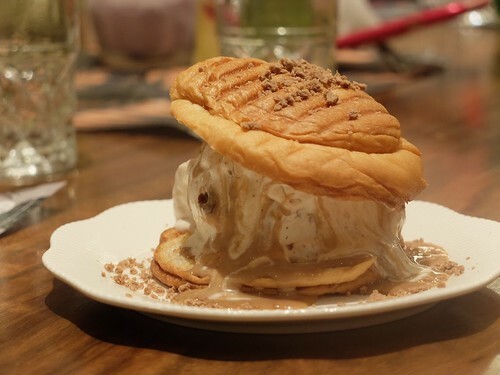 This time Bench Café presented it in a new light — Tsoknut Ice Cream Sandwich. It is basically a toasted ensaymada generously filled with tsoknut ice cream. We love ensaymada and we love tsoknut – so we obviously loved this sweet creation! However, this is something that can’t be eaten with your bare hands. You’d need to use your utensils or else, prepare to get messy! Leche flan will always be a staple dessert in a Filipino restaurant. 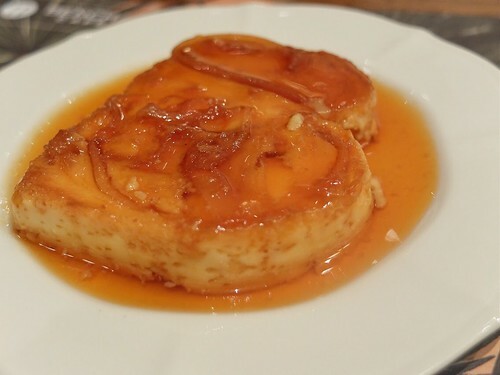 Bench Café’s “Flan B” has the usual taste of the traditional leche flan with macapuno. The only difference is the way it is shaped. We are used to seeing circle, oval or square shaped leche flan, but this time, it is B shaped (for Bench)! Whoever thought of this is absolutely clever. We were hoping to get their famous halo halo however, they ran out of shaved ice. Well, at least there is something to look forward to next time! 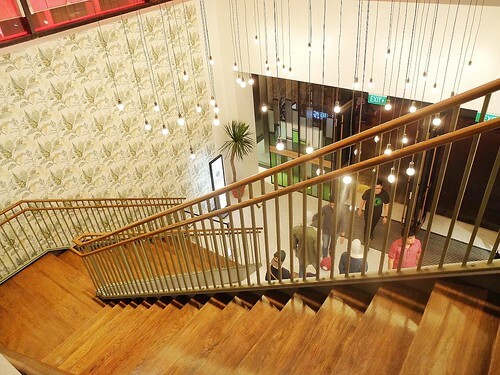 The grand staircase going up the café, the stylish yet relaxing interiors, the true Filipino flavors of the food, and the genuine customer service provided by its management and staff altogether made us feel that Bench Café is our newest home away from home.